Laurie Mika has taken color to opulence and beyond! 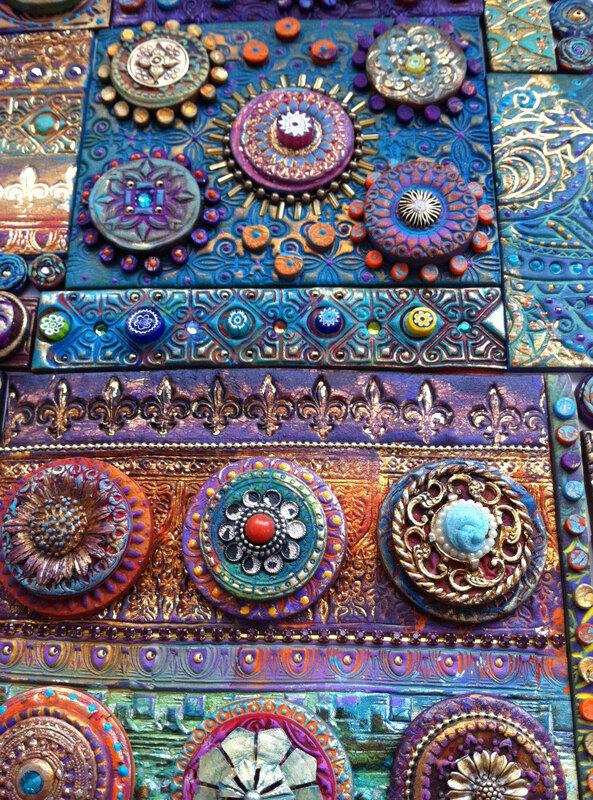 She’s piled on the layers of polymer, stamps, paints, metallics, inks and jewels to achieve a whole new level of splendor. This mosaic was inspired by the Indian sari trims Laurie found on her recent trip to Sydney. When you examine the large version of this snippet from a piece for her Petaluma, CA, Wild About Tile class, it’s hard to know where to look first. Explosions of color detonate in medallions and fire across borders. Don’t you wish you were in her class? Have a splendid weekend. About “medaillons”…what about Exalted Beauty’s? Wow! Trying to pick my jaw back up here… That is just incredible! This is a fine example of; it’s not the material you use, it’s what you do with it. Stunning!! One doesn’t know where to look first….and I couldn’t stop looking. I can’t even think of words to describe this piece. The more you see, the more you see, if you know what I mean. Exquisite! I am one of those people who find complex images like this very soothing. the levels and layers of color and texture just seem to draw you in deeper and deeper. Makes me want to cut work and head home to my nice blank ceramic tiles! Such a Friday treat. Wow! The colors are so rich. It definitely says indian all over. And the texture is awesome too. Amazing! I have her book and love her work. It would be fabulous to do a class with her. Just amazing. I don’t even know how to express my thoughts! Incredible!! I adore these sorts of colours, they make me think of oriental gypsies, rish desert sunsets, and the textures just look like they are alive!! Fantastic work, I look forward to seeing more!